Do you like pasta but feel it’s too hot during the summer to simmer your sauce like Nonna did? Are you looking for an alternative to preprocessed pasta dinners? 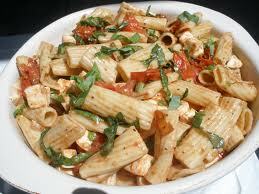 Here’s the perfect summer pasta dish! I call my husband “pasta boy”. I need to cook pasta not only 24 hours a day, but 365 days a year, including on the hottest days of summer: my pasta warden grants no reprieve for intemperate weather. In order to save my marriage and sweat glands, I delved into my epicurean subconscious and uncovered a dish that I recall seeing somewhere in my cookbook travels. Too lazy to sojourn down to the basement and search through a thousand cookbooks for the recipe, I improvised, using infallible syllogistic logic as well as adding my garden grown basil and cherry tomatoes. Having cooked and served it tonight and receiving my pasta boy’s accolades, kisses, and expressions of undying love, I decided to post it immediately on my recipe blog hoping that you will get a little appreciation (and perhaps a little action) from your appreciative spouse, too, for a minimal amount of effort on your part. Boil pasta to desired doneness. Immediately fold in all ingredients while pasta is hot: this is extremely important. Serve with grilled chicken breast and string-bean salad (recipe to follow). ← My Father’s Chili Hot Dog Sauce Recipe and the Ultimate Nightmare Hot Dog!